With these mesh Wi-Fi systems, spotty Wi-Fi will be a thing of the past. We have a strong commitment towards making the best recommendations for the best products on the market. We only recommend the best based on research, tests and user reviews. Some posted reviews provide us the benefit of receiving commissions from completed purchases through our content links. You can understand our review process further here. The brick walls and size of a large home can cause dead spots with a standard Wi-Fi router. While range extenders can help, they can't cut through problems like a mesh Wi-Fi system. These Wi-Fi systems have a lot to offer, including a home blanketed in coverage free from issues. You also won't have to worry about needing a lot of technical knowledge to setup and use one of these Wi-Fi systems. The router and modem connect easily to satellite units and communicate to create a great Wi-Fi range as a result. You'll have access to both 2.4GHz and 5GHz bands that make setting up a snap. From monitoring settings to using top pick routers, limited coverage will be long gone. There is a wide variety of options out there for you that can suit just about any sized home, though some may require you to purchase more than one mesh point to expand the network. Whether you just need enough internet for the basics or are an avid gamer, you'll be able to find something with the speed you require. There are also a number of options that depend on the kind of compatibility you need. 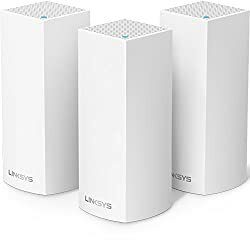 Rest assured that no matter what your internet needs are, there are plenty of mesh network systems that can meet them. Without a doubt, the top spot in this list goes to the Orbi High-Performance AC3000. Using this device, you'll be able to get 5,000 square feet of Wi-Fi coverage for your home. Furthermore, the Netgear Orbi system comes with a lot of great features, including simultaneous data streaming and lightning fast throughput speeds. Due to the tri-band system, you'll gave access to 400Mbps on the 2.4GHz band, 866Mbps on the 5GHz band and an additional band that brings the total up to 1,266Mbps. 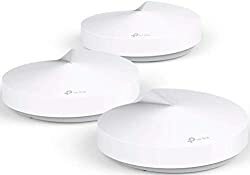 The Orbi satellites also offer four Gigabit LAN ports as well as a USB 2.0 port to give you plenty of connection points. In addition, the router itself includes the USB 2.0 port, a WAN port and three Gigabit LAN ports, ensuring that you'll have plenty of amazing connectivity options. That extra 5GHz option is also capable of fantastic throughput speeds, reaching up to 1,733Mbps. 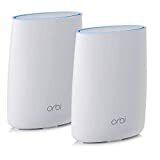 The Netgear Orbi also boasts six internal antennas and MU-MIMO capabilities. Between the router and its satellite points, you'll be able to get a lot of coverage for your home to ensure no user is left out. 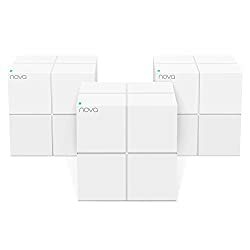 Each satellite point is capable of reaching around 1,500 square feet so you only need to add more satellites as needed to get plenty of coverage with this router. While most customers find that this setup really helps to keep their speed up, some do find that their internet speed actually decreases and they may even experience some random disconnects. Can increase the overall speed of your network. Allows multiple devices access to speed without having to fight for it. Capable of covering a larger range than other options. There can be some problems with connectivity and speed decreases. In some cases, the connection can drop unexpectedly. If you're looking for something with a high level of performance and the ability to cover a larger home, this is a fantastic option. Router setups can sometimes become an eyesore, but that can't be said for the design of the Google Wi-Fi System. It's made up to include three satellites that function as “Wi-Fi Points” to help expand your network. Not only does it have a lot of ability, but this Google system is fantastic if you're on the market for the best-looking device. You'll also be able to get a lot of blanketed coverage from these Google points, as each one is able to cover around 500 square feet. Overall, that results in a coverage of 1,500 square feet by the set of three hockey puck-shaped devices. The system is also easy to manage using an app made for both Android and iOS that can help with setting up your guest networks, checking on the status of your points and testing speeds. The Google Wi-Fi system also uses 2.4GHz and and 5GHz bands to give you more access and ability than a device with a single band. Furthermore, each Google point contains 512MB of RAM, a quad-core Arm CPU and AC1200 (2x2) 802.11ac as well as 4GB of eMMC flash memory. They are also beautifully-designed enough to be out in plain view without becoming an eyesore. In addition, you'll be able to keep the whole household online using this Google system, as it routes devices on the network to the strongest signal through the use of beamforming technology. That's something that single-band systems can't do. You'll also get access to Bluetooth radio, port forwarding and the ability to set up parental controls. One small downside to the peripherals is that they don't have USB ports to connect to, but the mesh 802.11s circuitry will help to ensure that you're getting high quality software and hardware in one of the best designs possible. Overall, the Google Wi-Fi System offers a lot of upsides to counter-balance. The speeds offered by this device often start out fantastic, but for a handful of customers it can taper out and result in lower speeds. Capable of covering a large range. Can boost speeds even when brick walls may hinder the signal of other options. Able to eliminate dead zones. In some cases the internet speeds can slow down after a few months of use. In some cases it may disconnect and reconnect unexpectedly. For those who value a great look as well as fantastic ability, this Wi-Fi system is worth trying out. This system is made up of two units that are essentially identical. These are the router and satellite that work together to offer you the very best in Wi-Fi security. The Ally Plus system is a great for keeping you protected from phishing attacks and harmful websites as a result. One small downfall of the Ally Plus is that it may come with slower speeds than tri-band systems because it lacks a third band. However, you will be able to enjoy up to 1,300Mbps on the 5GHz band through the use of the tri-stream (3x3). Through the 2.4GHz signal on the quad-stream, you'll also get 800Mbps. Both of which are higher speeds than you'll see from other standard two-band network devices. The Ally Plus also gives you the use of a mobile app, through which you can enable the use of AVG Security, manage other security features and even restrict access that any kids on the network may have. You'll also be able to keep control of the Wi-Fi networks, block unwanted websites and change the settings to keep the system from downloading malware. Without a doubt, these two units are great for helping you connect to the net while protecting you from potential problems. Alongside the security, you'll be able to expect the Ally Plus to offer you the kinds of fast speeds that can counter the signal loss due to the missing third band. It's definitely faster than most dual-band systems and can easily protect your group of devices from security problems. Overall, this system has received a lot of praise but there have been some instances when there was a small problem that couldn't be solved due to customer service being offline when needed. Covers larger areas more easily. Offers a speedy and seamless experience. Some customers have had difficulties getting in touch with customer service when needed. If security is extremely important to you and you want to be able to block off dangerous sites and downloads, this is a great way to go. The internet can be a dangerous place for kids, but the great parental controls on the Luma can work wonders to keep them safe. It offers a fast Wi-Fi connection and plenty of settings to ensure that your kiddos are safe while still offering you max speeds. This system offers excellent parental controls across three modules to help you maintain control over the kids while they surf. Furthermore, the Luma comes with an easy five rating level content filter policy, which allows you to change the access between G, PG, PG-13, R-Rated and unrestricted. You'll also be able to add users and set their individual access level as needed. If needed, the parental controls will also allow you to freeze the internet access to the entire network easily. In addition, you'll get an overall solid performance and access to two radio bands including 2.4Ghz and 5GHz bands. On the 2.4GHz band, you'll be able to get speeds of around 300Mbps, and the 5GHz band will offer around 867Mbps. You'll also find that the Luma is great at directing traffic to the most efficient band. With the Luma, you'll get a truly hassle-free way to control access using the mobile app and get your Wi-Fi up. While there is no desktop support, the 802.11ac router within each module in combination with the quad-core processor will ensure that you get the fastest speeds through automatic band steering. These AC1200 routers will work together to keep your internet up and running unless you decide to make use of the handy Pause feature. Many customers find that the process of setting this device up is simple and easy, but it can sometimes take multiple tries for it to work. Great for maintaining control over the internet experiences of children. Wi-Fi connection is fast and efficient. Some customers find that the service can sometimes be spotty. While the setup process is simple, it may not always work. For those who have children and want to keep them from the darker side of the internet, this is a fantastic device to use. If you need internet coverage for a large home, the Linksys Velop Tri-band AC6600 is the perfect option. It's made up of multiple nodes that that work together, each offering about 2,000 square feet of coverage. Purchasing a set of three of these good-looking nodes will give you 6,000-square-feet of coverage as a result, which is great for larger homes. You can also purchase nodes individually is you aren't looking for such vast coverage. 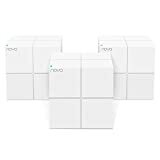 Each node has the appearance of a Jenga tower and contains an AC2200 router, allowing for more range and faster throughput speeds than other options. Through the bands offered on the Velop, you'll get around 400Mbps from the 2.4GHz band and maximum speeds of up to 867Mbps on the two 5GHz bands. Overall, the Velop is a great system that offers great data streaming capabilities as well as device prioritization. It also supports great guest networking features and Multi-User Multiple Input Multiple Output (MU-MIMO) features. Finally, you'll be able to maintain the parental controls on the network through the use of a convenient mobile app. Setup with this device isn't always easy. Some customers can find that the first node may not have a problem, but connecting multiple nodes can get tricky. Covers a large range of space. Some customers can experience problems with getting all the nodes to work together. The nodes can sometimes lose their connection at random. If you're looking for something that can cover a lot of space, offer a lot of power and won't be an eyesore in your home then this is a great device to use. 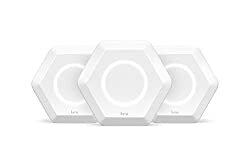 If you're looking to keep your entire home connected at a low price, then the Securifi Almond 3 System is worth a look. It's truly one of the best Wi-Fi systems that comes in at under half the price of other devices, which can sometime jump into the $300 to $600 range. While it might not offer the same extreme speeds as other systems, it's still a highly useful device and sleek nonetheless. Due to the design of the Almond 3, few would even be able to tell that it's a budget-friendly device. It also helps you through setup and customization using a touchscreen that displays windows-like tiles for easy navigation and even works with other high tech devices like Nest Thermostat, Amazon Alexa and Philips Hue lightbulbs. You'll even be able to shut off the network access to specific devices, though the parental controls aren't highly advanced so you can't restrict access on websites specifically. In addition, you can expect up to 867Mbps on the Almond 3's 5GHz band and max speeds of 300Mbps on the 2.4GHz band. In order to keep control of the network or use the device as a home automation system, you'll also have access to a handy mobile or desktop app. If you choose to try out this device then it's going to be important that you keep an eye on the screen because there have been some problems with it fading out over time. Comes with excellent tech support. Very easy to set up and use. Some customers have experienced problems with the screen. In some cases, the internet connection may drop unexpectedly. Not everyone is able to invest a lot of money into their router system, and the Almond 3 is able to provide you the coverage and speed you require without breaking the bank. For homes with dense walls or obstructions, the AmpliFi HD is a great way to maintain a solid internet connection. This device uses six high-density and long-range antennas to fill the space in large or multi-story houses without a problem. It's able to cover up to around 20,000 square feet, which is simply amazing compared to other devices. The AmpliFi HD strives to offer you a 5.25Gb aggregate speeds, which is quite a bit more than what other systems have to offer. It also has a great look, with a sleek aesthetic and a full-color LCD touchscreen that could be described as modern art. You'll also get a convenient mobile app through which you can check out current internet speeds and manage settings for your network. This router also uses two radio bands for you to access, made up of 2.4GHz and 5GHz Wi-Fi bands. These are made available through the single-core CPU housed within the router itself, while the two plug-in mesh points work to expand the network. On the AmpliFi HD router, you'll find a screen that will display the date, time and you'll also be able to use it to reveal WAN IP addresses and current throughput speeds with just a tap. 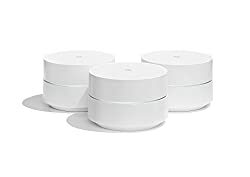 As one of the greatest of Ubiquiti's devices, this router will easily be able to manage traffic and segregate its dual bands to provide each band with separate SSIDs. The AmpliFi HD also uses 802.11ac circuitry in combination with these other features to allow excellent download and upload times. Because of its six internal antennas, the unit is able to cover large homes without a problem. Overall, this router is a fantastic system and has a lot to offer users. For some users, the router may start off working very well but then lose connection with their devices at random after a week or so. Capable of working well with many devices connected. Reduces or eliminates dead spots. Designed to offer a high level of performance. Some customers may find that their connection gets dropped too often. In some rare instances, the device may cease working altogether. Getting a strong Wi-Fi signal can be tough when you have a lot of space or obstacles in the way, and in those cases the AmpliFi HD is a fantastic solution. The Eero mesh Wi-Fi system is incredible when it comes to ease of setup. Many Amazon Reviewers have been thrilled by the ability to get it up and running in just a few minutes. All you have to do is connect the Eero to your modem using an Ethernet cable, and use the mobile app for added convenience. Once it's been plugged in, just wait for the indicator light to start blinking blue and then follow along with the on-screen instructions. These will help you with setting up, and the handy app will allow you to manage networks, test internet speeds and create guest networks. 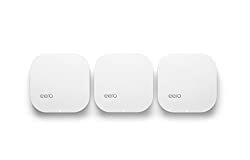 Through the use of the Eero's AC1200 Wi-Fi circuitry, 1GHz dual-core CPU and five internal antennas, it will be no time at all before you're getting solid throughput speeds. Due to its matte edges and white high gloss covering, the Eero really has a praiseworthy design. This is to be expected, considering the company named it after industrial designer and architect Eero Saarinen. Using three identical units made up of two satellites and one router, you'll get a great look and a lot of power from this delightful system as a result. Over time, the connections offered by this device can sometimes weaken and drop at random, and as a result it may need to be rebooted often to maintain the connection. Great for keeping several devices connected. Eero software is always being improved for a better experience. In some cases, the device can drop connections and require frequent rebooting. Some customers find that the device has trouble picking up IP addresses automatically. If you're annoyed by Wi-Fi systems that are too complicated to set up, then this is a fantastic option for you. It can be difficult to get reliable Wi-Fi in a larger area, especially if you also want that Wi-Fi to be secure. Luckily, for the Deco M5 Wi-Fi System, you'll be able to trust that security is key. Not only can this device provide great signal strength, but it also protects the entirety of your network against nasty online threats. While it ay suffer a bit of a signal loss due to the lack of a dedicated backhaul band, the M5 system has more features than you'll find with other systems. 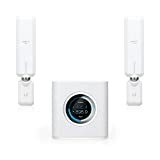 It's also important to keep in mind that the M5 connects to TP-Link constantly, meaning there won't be any access point mode that you may be able to use with an existing router. In contrast, this device does offer a lot of other useful features. For most, the M5 is an easy to use device that can be expected to be reliable and pack more benefits than many Wi-Fi systems. Just keep in mind that there can be some signal loss on the M5 when the units are connected together wirelessly. While most have enjoyed using the Deco M5, there can be some issues with speed and the app being glitchy. Capable of covering a larger range. Able to help clear away dead zones. Some customers have noticed problems with the app freezing up. For another great security option, the Deco M5 is well worth a shot. If you're looking for something that is ideal for large homes, the Tenda is a fantastic option. This system is able to offer excellent Wi-Fi coverage, able to cover up to about 6,000 square feet of space. Though this option tends to work great for larger homes, it can struggle in medium-sized office spaces. In addition, you can expect all the parts of this system to connect together, functioning as one Wi-Fi network for everyone to use. Due to the network optimization technology included with the Tenda device, you'll be able to access a near-invincible connection. Furthermore, it uses Wave2 MU-MIMO tech to ensure that all of your devices are able to stay connected at once. This neat beamforming technology does a lot to add to your overall experience. Due to the plug-and-play design, there is no special setup that you'll have to worry about, allowing you the utmost in simplicity. Furthermore, the unique technology involved helps with focusing your connections, ensuring that devices in every room are getting the optimal band. It also offers an easy-to-understand LED status indicator to help keep you in the know about your connections. Even if one unit has gone down, this system strives to maintain the integrity of your system, allowing your device to automatically search for the nearest one that is available. That way, if you disconnect one unit, you'll still be able to connect to the Wi-Fi system. In addition, the device is also capable of working with Alexa, allowing you to change and set up parental controls and offers 2 Gigabit ports for each unit. Overall, if you're looking for something that focus-transmits power wherever you need it, this is a top option in this list. While many have greatly enjoyed this system, some can find that it may be harder than expected to set up. They may also find that it can drop signals at random. For those who are looking for something unique, new and fully able to offer a great range, this is a fantastic option. Sign up to have tech tips sent to your inbox every week.